Student retention (preventing students from quitting or dropping out) is a major concern for online learning. So why do students drop out in the first place? One reason is a lack of engagement. Indeed, some of our friends over at edX previously found that students tend to stop watching lecture videos that go beyond 4 or 5 minutes. Our team has already done an incredible job of making online lessons more engaging. In a previous post, we showed how we increased student attention span up to 20 minutes with our highly interactive lessons. So the engagement problem has largely been solved. 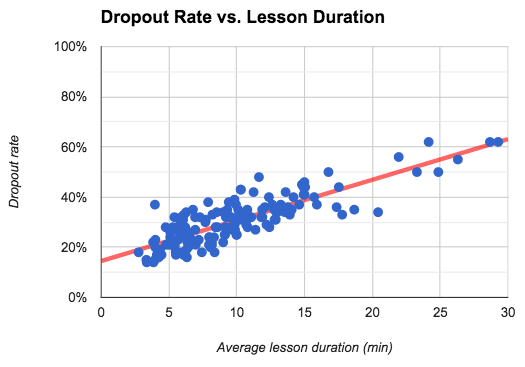 But while we've reduced dropout rates, a fair number of students still drop out of our interactive lessons. 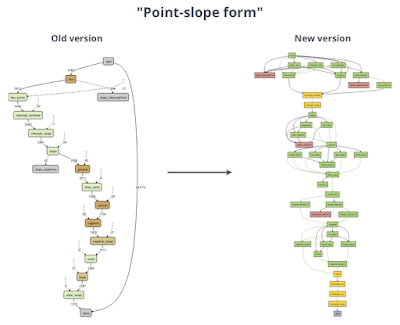 So we asked ourselves: what's going on here, and what we can do about it? 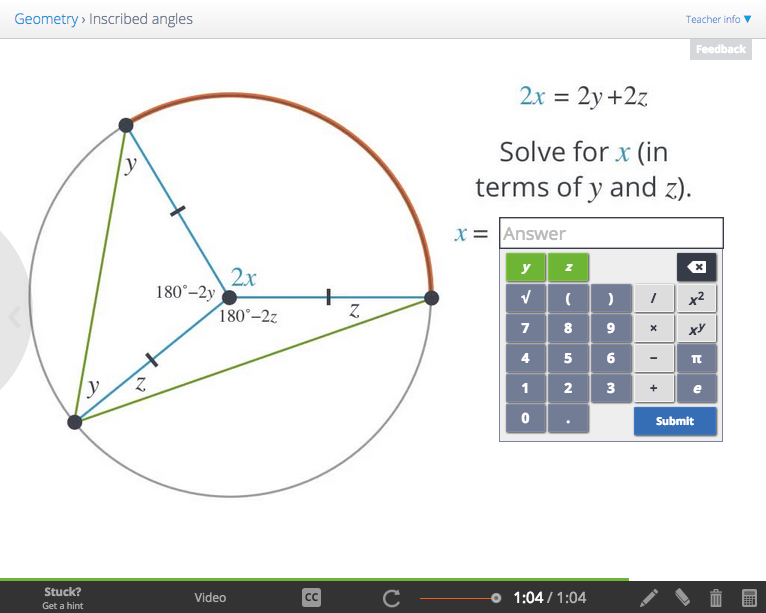 Now imagine you're working your way through a step-by-step, interactive lesson. You know what you're doing, getting every question right, but suddenly you hit a snag. You just can't seem to get this next question. Now you could ask for a hint, or you could try a few different approaches, but sometimes you'll just quit out of frustration. With an in-person tutor, this wouldn't happen. 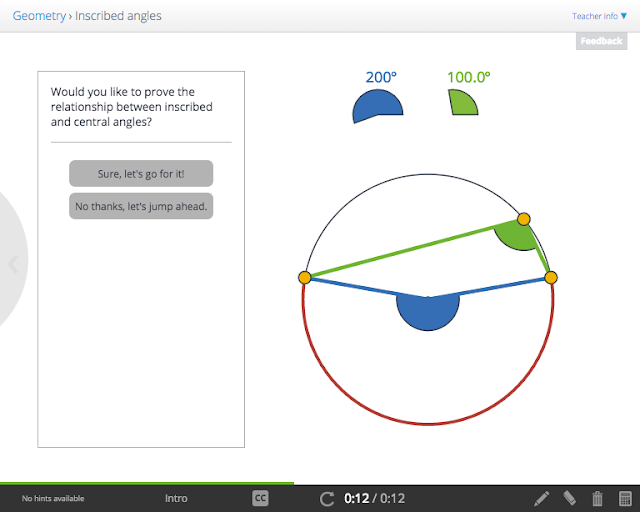 A live tutor can diagnose exactly where you confusion is and help you get "unstuck." So our hypothesis is this: students drop out when they're told their answer is wrong without immediate, useful feedback. Now if we were to keep doing this, adding new branches to lessons where we accept all the wrong answers students give and provide specific feedback, that could take us forever (and we don't have that kind of time!) So the strategy we've adopted is to address the common wrong answers, prioritizing where students frequently make similar mistakes. It turns out that for most questions, students are only giving a handful of answers. For both of these question types, on average, more than 90% of students give either the correct answer or the two most common wrong answers. 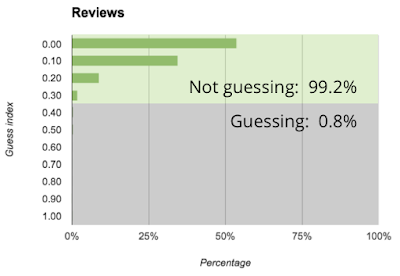 So if our team should addresses the top two wrong answers, we should achieve 97% retention for each question. It takes our team about a day to make a lesson, and it would only take another day to update the lesson so it offers specific feedback to more than 90% of students. So we'll continue to update our lessons, making them increasingly adaptive over time. And we won't have to pull any all-nighters to get it done! Last Friday, School Yourself CEO Zach Wissner-Gross sat down with Jay Sugarman, the host of Innovation Showcase on NewTV (based in Newton, MA). During the half-hour program, they discussed the origins of School Yourself, how the team personalizes learning at scale, and what's on the horizon. 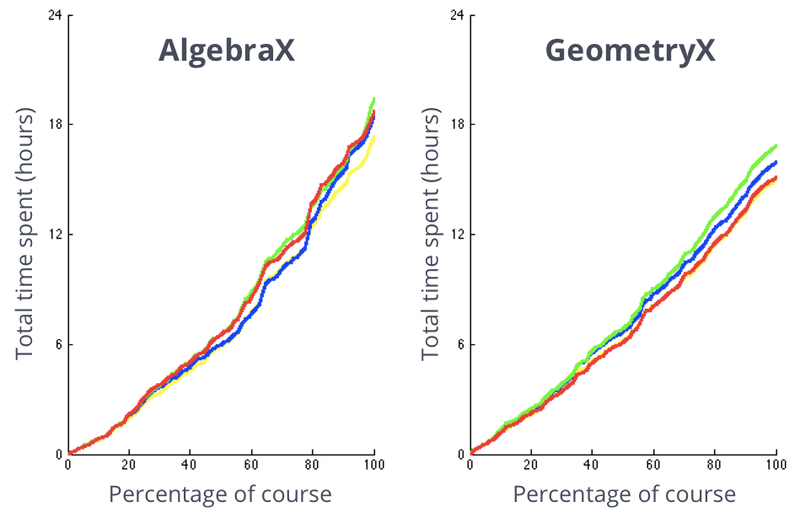 In other news, we're proud to announce that the students in AlgebraX and GeometryX, our two MOOCs on edX, have now collectively solved more than 5 MILLION review questions. We're very proud of this milestone. And more students are signing up and working through these courses every day! Now that thousands of students have gone through the 88 interactive lessons of AlgebraX (not to mention the 92 lessons of GeometryX), we're starting to see trends emerge. We previously found how engaging our interactive lessons are (compared to plain video lessons), and in this post we'll dive into the content itself. 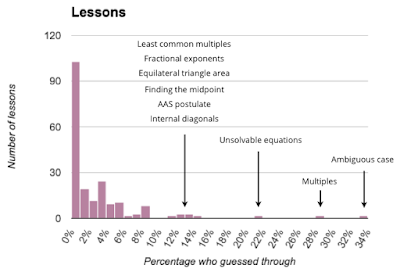 One thing we hear over and over again is how hard algebra is. It's true -- learning algebra can be quite challenging. 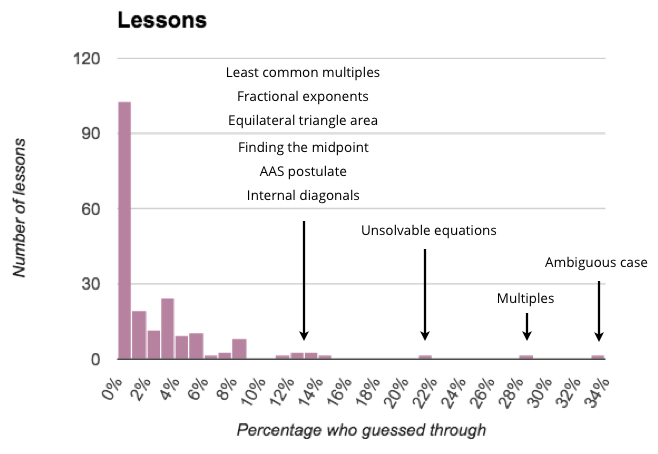 But it's also important: every subsequent math subject (geometry, trigonometry, calculus, statistics, and so on) builds on the foundations of prior ones, starting at algebra. One way to measure the difficulty of different topics is to look at how many students completed review questions (the assessments in AlgebraX) vs. how many students attempted those questions. 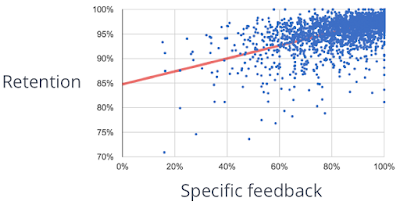 If a topic is hard to learn (and/or our lesson on that topic could use improvement), we'd expect to see fewer students complete the corresponding review. Now this differs from how advanced a topic might be. For example, factoring quadratic polynomials is pretty advanced stuff for Algebra I, but students zipped right through those review questions in the course. 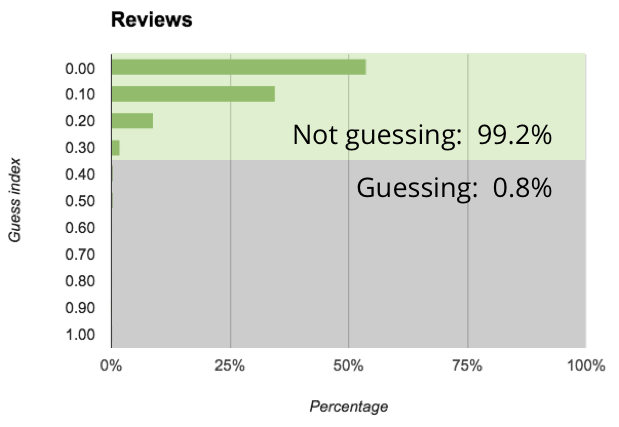 Here's a bar graph showing the completion of all the reviews in AlgebraX. 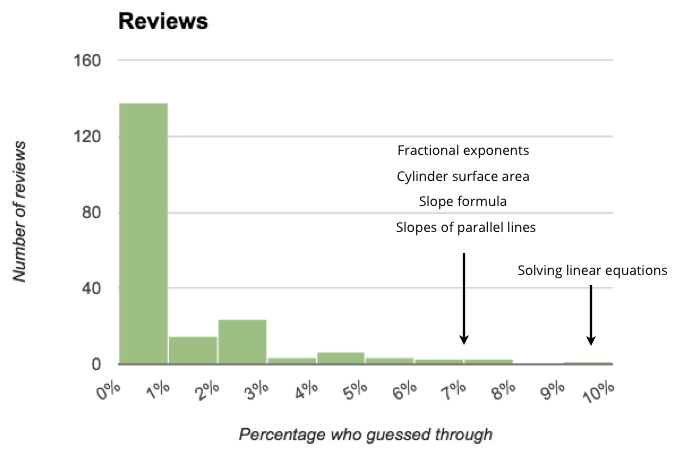 Each topic has its own bar, and the vertical axis shows the percentage of students who started a review who finished it (meaning they mastered the topic). And what's the "easiest" topic? You might think it's something early on in the course, but then you'd be wrong. It's simplifying expressions by combining like terms, a topic that 99.8% of students have mastered. 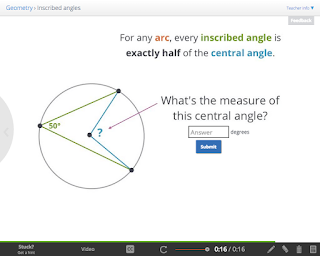 We're already underway improving the more challenging topics in the course, both by improving the lessons themselves, as well as by adding new hints to review questions. Our goal is to turn this entire chart green. Yes, algebra will still have advanced topics, but nothing will be too hard for students to conquer! As edX CEO Anant Agarwal has said, our courses represent the first two adaptive MOOCs on the edX platform, where students can "choose their own adventure" through each lesson, enjoying an experience that is tailored to their individual knowledge and abilities. And we're using all the data we're collecting to improve these lessons and add more paths for different learners to follow. 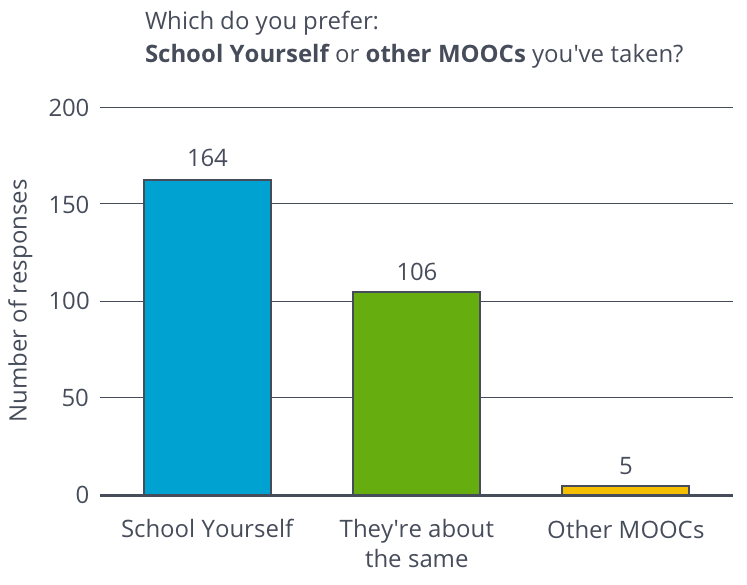 Despite our MOOCs being only a few months old, we can already measure how they're being received. One important metric is engagement, or how long students' attention is focused. 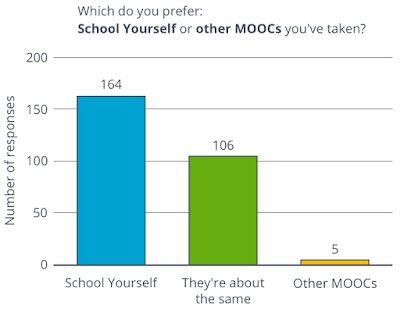 One-on-one learning certainly is more engaging than a lecture, but does this trend translate over to MOOCs? How do interactive, personalized lessons compare to passive video content when it comes to online learning? Researchers have studied how long students will watch videos on edX before "dropping out," which in this case means closing the video. 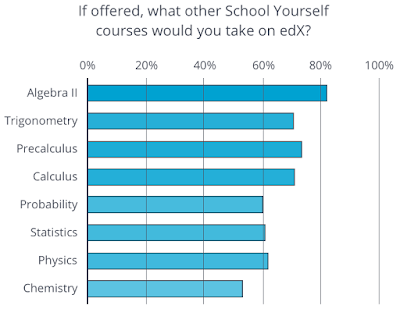 This data was collected from four of edX's most popular MOOCs. One way to interpret this graph is to look at where the trend line crosses 50% (at about 4 minutes). So after about 4 minutes of a video, half the students have dropped out. 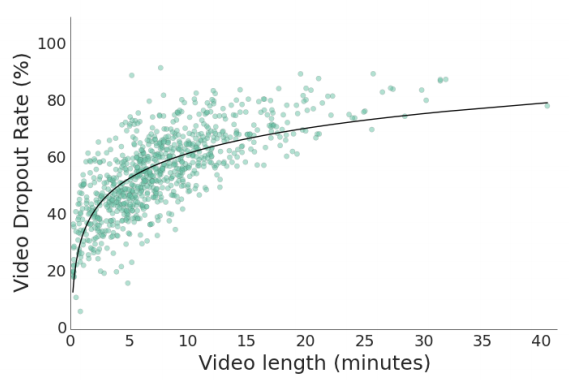 With passive video content, MOOC students have an attention span of 4 minutes. You're reading that correctly -- the trend line doesn't cross 50% until about 22 minutes. 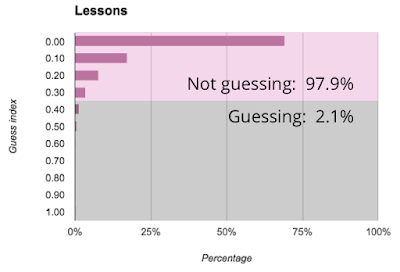 So with our interactive personalized lessons, attention span is 22 minutes, a 450% increase over passive video. Now this isn't a perfect comparison. The user interface for our lessons is a little different from the traditional YouTube scrub bar that appears in most edX videos. Also, because of the adaptive nature of our lessons, different students will spend different amounts of time on any given lesson. 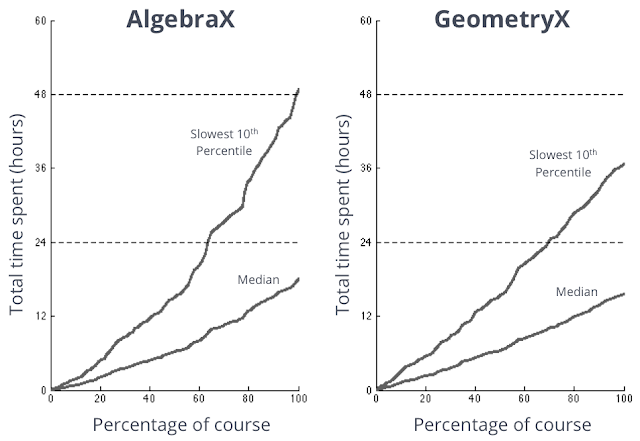 So to generate the above graph, we used the average lesson duration among students who completed the lesson. 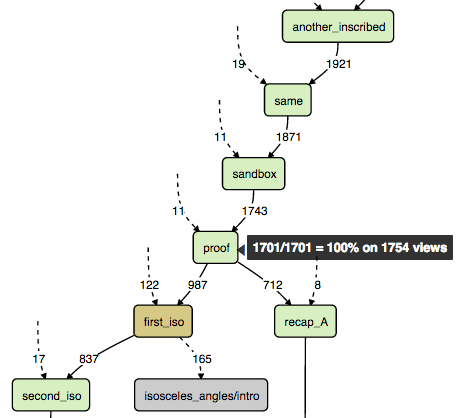 But despite these difficulties in comparing interactive versus passive video content, the difference is striking. It's our hope that online learning (and MOOCs in particular) continue to become more personalized and interactive over the coming years. It seems that with this evolution, increased engagement will be an added bonus!